The Fourth » I’m sure it will be easy and not involve any conflicts or adventures. I’m sure it will be easy and not involve any conflicts or adventures. That’s Lorelei’s protective hug. Often used on Mr. Skärva. Often used against Mr. Skärva. That’s what you get for not looking behind the black. …is there going to be a frog tending bar? Ha. I spent a lot of time while drawing that last panel listening to JRL music on loop, so I’ll see what references I can drop. There aren’t frog-people in Idenau, but there are… well, you’ll see! I always loved how when you were stuck somewhere there would be a convenient plot device that would allow you to continue in old adventure games. XD Just like the convenient port town with boats. Lorelei always seems to know how to make things better doesn’t she. To the south is OCEAN. To the north is ROAD. What will you do? That won’t help you very much. Oh! It’s a nice convenient port town with boats. Indeed. To be fair, her solution is usually the same… but hugs are such an elegant cure. He need only stop and think for a moment to realize a dead bard equals a useless compass… game over! That option does not exist. I like the seagul, and the black-blobby people, and Lorelei’s “protective” hug. VuV I’m also gradually liking Cyril more…and that’s no good. GTA: Idenau. That would be pretty lame considering cars are an extreme rarity. It’d mostly be hopping on wagons. Maybe a zeppelin. It’s your fault Courtney! Stop making him so…adorable and likeable! …So you wish him to DIE now?! This seems to be a sort of running gag. Just. . . If you need a filler panel, just add one where somebody stole the car. Egg in Biscuit in Beef In BACONNN! Well, you lost me at the breakfast part ^_^; Sounds good though! The road the came to the beach to is made of sand. I remember the last comic’s comments saying how hard it is to drive in sand, so either Idenuaian cars are better at sand driving or that must have been a rough drive. 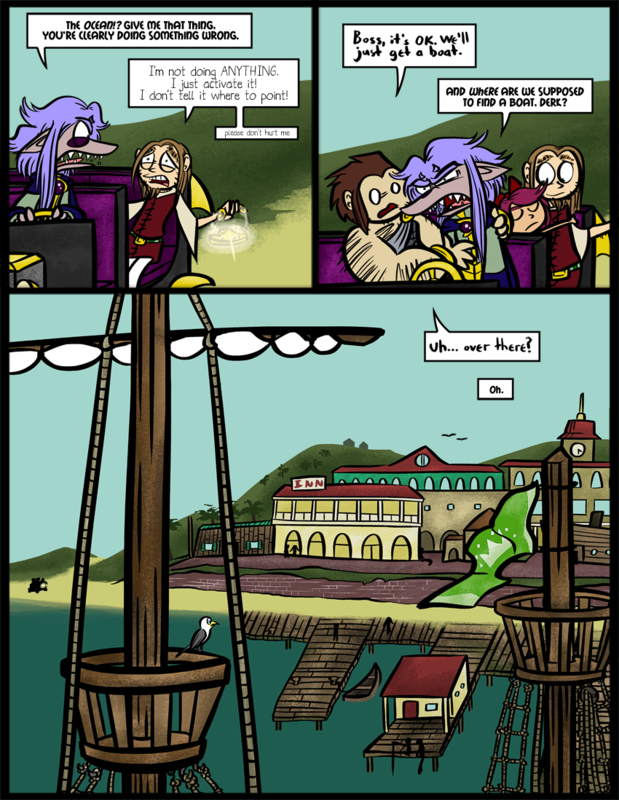 Also that flag makes it seem like this town won’t be exactly keen on helping Skarva sail out like a pirate. (because let’s be honest, who isn’t going to imagine them as pirates? he already has the black eye to cover with an eyepatch). I don’t know about Idenian cars in general, but the sharkmobile is awesome. It does remind me of a Mario Kart- those things LOOK pretty weak but they can drive right along a beach and even through water up to the driver’s head. I like the idea that Skärva launched the car into the sand through sheer momentum. I really like Skärva’s annoyed look, dunno why. Well I drew him being super mouthy. He’s not quite a Basking Shark though. Skärva’s looking pretty pissed… I’m worried about his blood pressure. Calm down, Skärva! You needn’t worry; he has a bodyguard and a healer everywhere he goes. The man is spoiled rotten, to be honest! Ha. They may well be friends, though. She has eyes and ears everywhere! Well, actually, I think the seagull is friends with this one flish that owns this one bar that has a secret shipping business, and this one employee in said secret shipping business, knows some random zombie, who in turn knows this one guard, who fell in love with a maid, who works for a maid that feeds Veronica’s bird. Ah, well, Skarva’s tunnel vision obviously isn’t helping him, because that town REALLY should have been obvious. I’d laugh if the seagulls were like the ones in Finding Nemo, except they’d steal their food and Derk’s bacon. Just a thought….They’ve been following that…’compass’ for some time. Have they tried pointing it in a different direction and making sure it’s not just a light sculpture? It’d be rather humorous if they were just following a piece of art to nowhere. Haha. Yeah, it’s been pointing south. If you hold it by its chain, like he’s doing in the first panel, it will actually pull itself towards that direction like a magnet, as well. The “arrow” on the compass always points the same direction, but the medallion rotates to align itself. Aaah, cool. Just wasn’t sure if they’d had the thought to test it. Skarva tends to just get a really cool idea (as guessing by the love potion debacle) and then just say “Yeah! That’s AWESOME!” and follow with no testing of any individual part (That I’ve seen, then again, it’s not AS amusing to show them testing something). Although if that love potion actually worked as implied, more power to him. nadiesM lateral….Nah dice lateral…..Well…yeah, I haven’t been rolling ones or sixes alot lately, but still, mister Captcha, you don’t have to be so mean. I have the feeling pirates are on the horizon…..
Can Skarva swim? He’s sharky but honestly I’d believe anything at this point. Also which torgesta? I dunno captcha, probably the swedish one.. The seagull is aware. The seagull understands. The seagull has seen the enemy. I guess that’s why they call him a see-gull! I dunno, that made ME laugh pretty hard. But I am a shameful fan of puns.